The Self-evaluation and Holistic Assessment of climate Resilience of farmers and Pastoralists (SHARP) was developed to address the needs of smallholder farmers and pastoralists to assess their climate resilience at the level of individual households and communities. The tool has a strong scientific grounding. It was designed – in collaboration with the University of Leeds – by building on a thorough assessment of existing literature on climate resilience and through significant consultation with experts in many fields of study. One step also involved an expert e-discussion, which was announced on this portal last September. Particularly, SHARP is designed to assess the resilience of agro-ecological systems based on 13 indicators developed by Cabell and Oelofse (2012). At the same time, a key feature of SHARP is that it allows one to capture the needs and views of those most affected by climate variability – smallholder farmers and pastoralists themselves. The SHARP tool has been strengthened throughout over two years of development by numerous field tests, pilots and reviews from both FAO and external experts and is constantly being revised and fine-tuned in order to tailor it to specific agroecological contexts and project needs. The tool is now moving from its development phase to its implementation. While SHARP has been originally designed for use within Agro-Pastoral/Farmer Field Schools (AP/FFS), the assessment is extremely flexible and can be adapted to different project needs and objectives. The assessment is undertaken through an interactive, participatory survey administered through a dedicated tablet application. The survey is composed of 52 questions that touch upon different aspects of agro-ecosystems that directly affect climate resilience. These are organized around four areas that investigate into agricultural practices; natural resources and environmental conditions; social aspects; and economic variables. Plenty of space is left for interviewees to elaborate on their responses, in order to dig deeper into the causes behind high or low degrees of resilience of specific components of their livelihoods. The use of tablets for recording information allows for maximum flexibility and immediate results: several people can be interviewed at the same time and in a participatory manner in group settings and data collected can be easily shared with a central database. 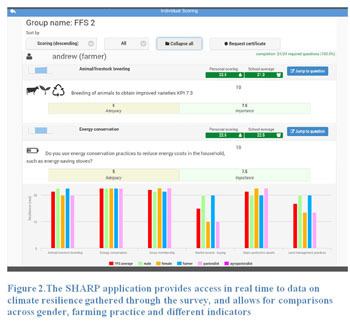 In addition, the application automatically generates a final report containing a preliminary analysis of data collected – and offers the possibility to compare in real time the scoring and highlight the best or worst components of the farming or pastoral system in terms of climate resilience in order to engender discussions while in the field (Figure 2). Once the resilience assessment is completed, data gathered will be integrated with other relevant information – especially related to present and foreseen climatic conditions in each country and region – with the final aim of providing farmer and pastoral communities with a toolbox of options for improving their resilience to climate change. Rather than a top down imposition of practices to adopt, this method will allow individuals and communities to discuss in a participatory way and pick the practices that best suit their needs. SHARP has been tested in several countries within the framework of GEF-funded Climate Change Adaptation (CCA) projects in sub-Saharan Africa – namely Uganda, Mali, Senegal and Zimbabwe. A SHARP training and piloting using the tablet application was carried out in Angola in March and April 2015 and involved around 30 local government officials, extension workers, representatives of cooperatives and AP/FFS facilitators. It also led to surprising findings, in that respondents within pastoral communities turned out to be more concerned about crop production issues (e.g. the lack of enough varieties, low productivity) rather than solely about livestock-related ones. This finding helped reconfigure the focus of the project towards the needs of the farmers and pastoralists. 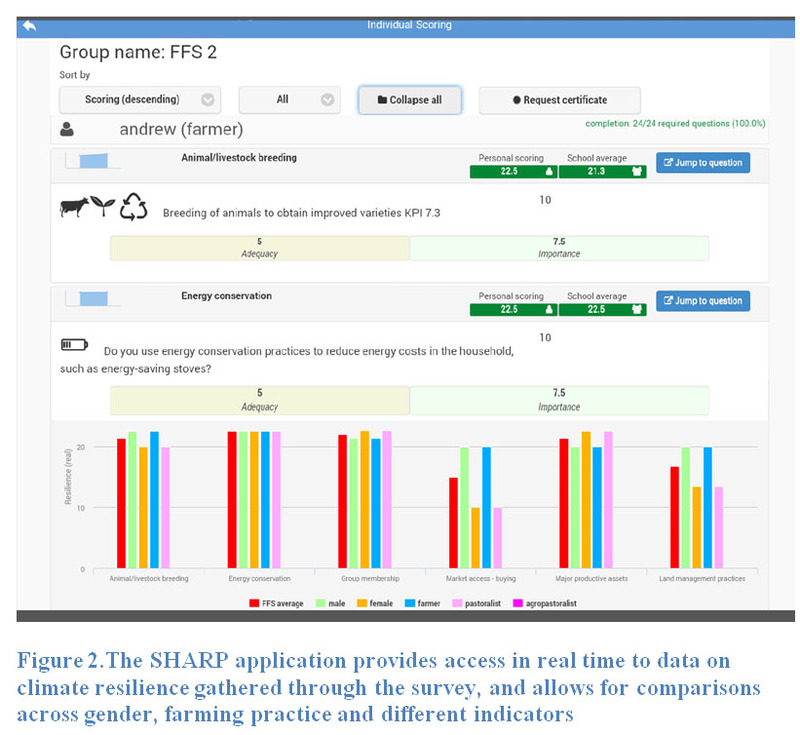 Later this year the SHARP documentation will be published as an FAO document, the SHARP application will be made available through the FAO Google Play store and an academic article on the SHARP methodology will be published in a peer reviewed journal. In August 2015, a second SHARP pilot will be organized in Niger, and further integration with GEF CCA projects is foreseen over 2015 and beyond. Partnership with NGOs and actors working on the ground are also being explored, in order to expand the outreach of SHARP to those organizations that already have solid grounding in the field and are in need of a tool for resilience assessment. SHARP is being developed to be easily adapted to different contexts and the SHARP team stands ready to provide information and support for colleagues who might be interested in applying a participatory self-assessment on resilience in their own projects.